The University of New Brunswick’s fifth annual UNB Remembers ceremony will be held in Fredericton on Monday, Nov. 6, beginning at 11:30 a.m. in the Memorial Hall auditorium. UNB Remembers brings the university community together to pause and reflect on the impact of war on students, faculty and staff. 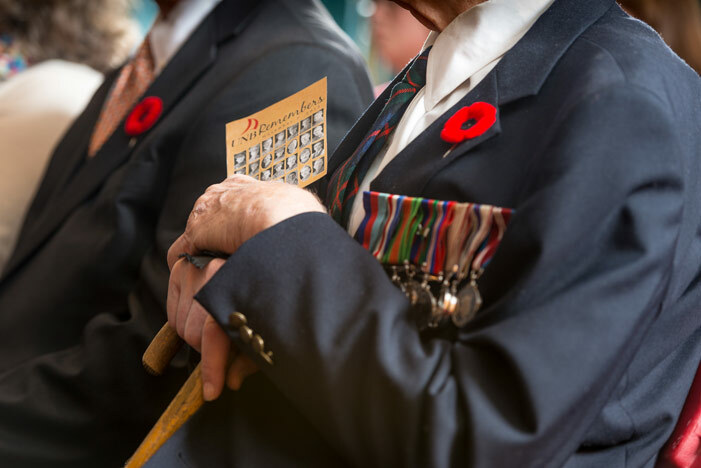 The ceremony commemorates the service and sacrifices of UNB members in wartime and beyond while contemplating the toll of past and present conflicts on the lives of people around the globe. During this year’s ceremony, members of the UNB community will read biographies of alumni George Fenwick, Walter Donahue and Milton Gregg, a former UNB president and eponym of The Gregg Centre for the Study of War and Society. All three fought in the Great Wars. UNB’s Susan Montague will speak on “Architecture and Memory at UNB.” Ms. Montague is the author of A Pictorial History of the University of New Brunswick – a 300-page volume with more than 500 illustrations which delves into the rich history of Canada’s oldest English-language university. Wilfred Langmaid, UNB student advocate, will reflect the nature of war and remembrance. Also speaking this year will be UNB graduate Mohammad Bakhash, who came to New Brunswick as a Syrian refugee as part of the Canadian government’s recent resettlement program. Mr. Bakhash will share his experience and the impact war has had on his life and the lives of countless others. The Act of Remembrance will be read and a moment of silence held. All members of the public and the UNB community are welcome to attend. The ceremony will also be available via livestream at UNB Remembers.